Geneva (French: Genève) is the second-most populous city in Switzerland (after Zürich) and is the most populous city of Romandie (the French-speaking part of Switzerland). 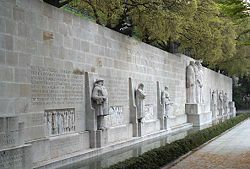 Geneva was a center of the Reformation in the sixteenth century, and was a favored destination for persecuted French and Italian Protestant refugees. Politically and culturally cut off from its geographic surroundings following the Reformation, the city was forced to develop relationships with more distant European locations and overseas nations. This undoubtedly helped to shape its character as a city willing to reach beyond the common borders of nationality or religion. Today Geneva is a worldwide center for diplomacy and international cooperation. It is widely regarded as a global city, mainly because of the presence of numerous international organizations, including the headquarters of many of the agencies of the United Nations and the International Red Cross. It is also the place where the Geneva Conventions were signed, which chiefly concern the treatment of wartime non-combatants and prisoners of war. A survey conducted by the Mercer Consulting Firm in 2008 found Geneva (for the 2nd year in a row) to have the second-highest quality of life in the world, tied with Vienna, Austria and outranked only by Zurich. 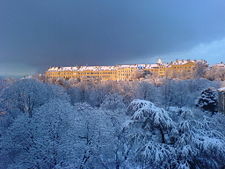 The old town of Geneva in winter. The Eaux-Vives quarter of Geneva. The name Geneva is probably of Celtic origin; the city was mentioned in Latin texts with the spelling Genava. The name takes various forms in modern languages. 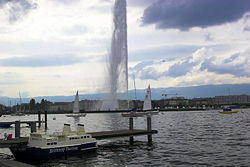 Geneva is located at the southwestern end of Lake Geneva (French Lac Léman), where the lake flows back into the Rhône River. It is surrounded by two mountain chains, the Alps and the Jura. The city of Geneva has an area of 15.86 km² (6.1 sq mi), while the area of the Canton of Geneva is 282 km² (108.9 sq mi), including the two small enclaves of Céligny in Vaud. 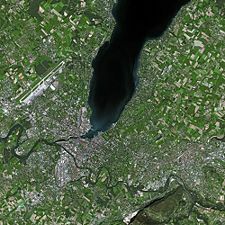 The part of the lake that is attached to Geneva has an area of 38 km² (14.7 sq mi) and is sometimes referred to as Petit lac (English: small lake). The Canton has only a 4.5 km (2.8 mi) long border with the rest of Switzerland; out of a total of 107.5 km (66.8 mi) of borders, the remaining 103 are shared with France, with the Départment de l'Ain to the north and the Département de la Haute-Savoie to the south. The altitude of Geneva is 373.6 meters (1,225.7 ft), and corresponds to the altitude of the largest of the Pierres du Niton, two large rocks emerging from the lake which date from the last ice age. This rock was chosen by General Guillaume Henri Dufour as the reference point for all surveying in Switzerland. The climate of Geneva is temperate. Ice storms near the Lac Léman are normal in the winter, when the average maximum daytime temperature in January is 39°F (4°C). In the summer many people enjoy swimming in the lake, and frequently patronize public beaches such as Genève Plage and Bains des Pâquis. The average maximum is around 77°F (25°C) in July. Mean annual precipitation is 33.5 inches (853 mm). The second main river of Geneva is the Arve River which flows into the Rhône River just west of the city center. Most of the drinkable water (80 percent) is extracted from Lake Geneva; the remaining 20 percent is provided by groundwater originally formed by infiltration from the Arve River. Thirty percent of the Canton's electricity needs is locally produced, mainly by three hydroelectric dams on the Rhone River (Seujet, Verbois and Chancy-Pougny). In addition, 13 percent of the electricity produced in the Canton is made from the heat induced by the burning of waste at the waste incineration facility of Les Cheneviers. Natural gas is available in the City of Geneva, as well as in about two-thirds of the municipalities of the canton, and is imported from Western Europe. L'Escalade celebrating the defeat of the surprise attack by troops sent by Charles Emmanuel I, Duke of Savoy, in 1602. The Jet d'Eau in Lake Geneva. The first traces of human civilization in Geneva, discovered on the shores of Lake Léman, date from around 3000 B.C.E. The hill of the Old City that dominates the outlet of the lake, was not inhabited until 1000 B.C.E. Around 500 B.C.E., Geneva was a Celtic fortified settlement. The name Geneva first appeared in history as a border town, fortified against the Celto-Germanic Helvetii, which the Romans took in 120 B.C.E. The Romans and the Helvetians used Geneva as a staging point in the campaign for Gaul in 58 B.C.E. By 379 C.E., Geneva was the seat of a bishop and was within the Roman Empire, although details remain under debate. In 440 St. Salonius appears as Bishop of Geneva. In 443 C.E., the city was taken by Burgundy, and, with the latter, fell to the Franks in 534. In 888, the town was part of the new Kingdom of Burgundy. In 1032, the kingdom passed into the hands of the Germanic emperors. From the eleventh century to the Reformation, bishops who had become the de facto lords of the city ruled Geneva. In 1387, Bishop Adhémar Fabry granted the town its great charter, the basis of its communal self-government, which every bishop on his accession was expected to confirm. 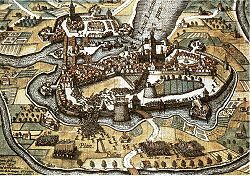 Genevese counts controlled the city until they became extinct in 1394. From 1416, the dukes of Savoy dynasty sought to bring the city under their power, particularly by elevating members of their family to the episcopal see. Geneva's burghers had the Savoy dukes recognize the public assembly, to which every citizen belonged, as the city's legislative body. Geneva's trade fairs reached their peak in the fifteenth century, giving the city an international reputation. During the first third of the sixteenth century, the Swiss cantons of Fribourg and Berne helped Geneva retain its autonomy against Savoy. The Protestant Reformation that began in 1517, plunged Geneva into new entanglements. In 1511, the nearby Catholic city of Fribourg had renounced its allegiance with Geneva. The city of Berne, located further to the northeast from Geneva, favored the introduction of the new teaching and demanded liberty of preaching for the French evangelists Guillaume Farel (1489–1565) and Antoine Froment (1508-1581). In 1532, Geneva's Roman Catholic bishop, Pierre de La Baume, was obliged to leave his residence, never to return. The burghers declared the See vacant, and proclaimed themselves a a republic in 1535. Savoy threatened to invade. Geneva needed military support from Protestant Berne. In 1536, the burghers declared the city Protestant. 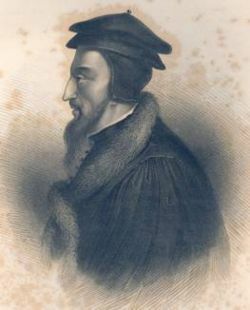 French theologian and Protestant leader John Calvin (1509–1564), was based in Geneva from 1536 to his death. While expelling all those who would not convert to the Reformed religion, Calvin presided over Geneva's transformation into a modern city-state. The city was called "Protestant Rome," and from 1550, persecuted Protestants—mainly French and Italians—streamed into Geneva. Geneva became a center of Protestant activity, producing works such as the Genevan Psalter, though there were often tensions between Calvin and the city's civil authorities. Though the city proper remained a Protestant stronghold, under bishop St. Francis de Sales (1567–1622) a large part of Geneva returned to Catholicism in the early seventeenth century. The Roman Catholic Charles Emmanuel I, Duke of Savoy (1562–1630), led a final unsuccessful attempt to recapture Geneva with a surprise attack on the night of December 11–12, 1602. French and Italian Protestant refugees included noble families who assumed a right to rule. From the mid-16th century, these nobles controlled an aristocratic Council of Twenty-five, which took over city government while the public assembly rubber-stamped decisions. By the end of the seventeenth century, opposition to the aristocratic rulers grew among the diminishing numbers of residents who qualified as citizens. A second wave of refugees flooded into Geneva at the end of the seventeenth century following Louis XIV's persecution of Protestants in France. The eighteenth century was a golden age when industries, especially horology, business and banking boomed, while culture and artistic creativity in the 18th century flourished. Geneva was the birthplace of Jean Jacques Rousseau (1712–1778), a home for Voltaire (1694–1778), and attracted other Enlightenment luminaries. The revolution in Geneva in 1792 brought down the aristocratic government of the Ancien Régime. Geneva was annexed by France in 1798 and made the administrative center of the Department of Léman. Freedom was returned on December 31, 1813, after the defeat of Napoleon Bonaparte's armies. The republic's magistrates sought entry into the Swiss Confederation, which was granted in 1815. That year, the Congress of Vienna fully re-established Swiss independence and the European powers agreed to recognize Swiss neutrality, marking the last time that Switzerland fought in an international conflict. A revolution in 1846, led by James Fazy, overthrew the restored government. A civil war broke out in 1847, caused by the Sonderbund, which was league among seven Catholic and Conservative cantons, seeking to protect their interests against a centralization of power. The war lasted for less than a month, causing fewer than 100 casualties, and resulted, in 1848, in a federal constitution and the extensive use of referenda in the process of government. 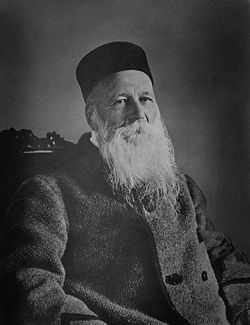 Geneva-born businessman and social activist Henri Dunant (1828–1910) inspired the creation of the International Committee of the Red Cross in 1863. The 1864 Geneva Convention, concerning the treatment of non-combatants and prisoners of war, was based on Dunant's ideas. After World War I (1939-1945), Geneva was chosen as the site for the headquarters of the League of Nations, the forerunner of the United Nations. The Palace of Nations in Geneva was built between 1929-1938 as the headquarters of the League of Nations. 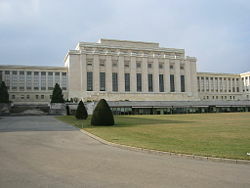 Since the 1950s, it has served as the home of the United Nations Office at Geneva, although Switzerland did not become a member of the U.N. until 2002. 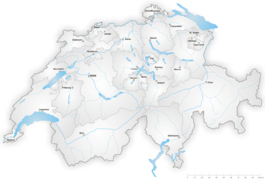 Switzerland is formally a confederation but similar in structure to a federal republic. The president is both the chief of state and head of government, representing the Federal Council, which is the formal chief of state and head of government, whose council members rotate in one-year terms as federal president. The bicameral Federal Assembly consists of the Council of States (46 seats) and the National Council (200 seats). The Swiss Confederation consists of 26 cantons, each of which are responsible for healthcare, welfare, law enforcement, public education, and retain the power of taxation. The cantons comprise a total of 2889 municipalities. Geneva is the capital of the Canton of Geneva, which continues to call itself La Republique du Genève. The canton is governed by an executive power, the Council of State, which consists of seven members elected for four-year terms, and by a legislature, the Great Council, comprising 100 deputies, also elected for four-year terms by proportional ballot. The canton is divided into municipalities (or communes) which have their own assemblies and a mayor, a (Stadtpräsident), who is a first among equals in the executive council. 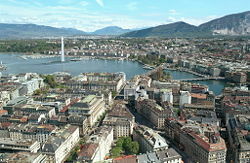 The city of Geneva is divided into eight "quartiers" or districts, often made up of several conglomerated neighborhoods. On the Left Bank (Rive Gauche) these include Jonction, Centre / Plainpalais / Acacias, Eaux-Vives and Champel while the Right Bank includes Saint-Jean / Charmilles, Servette / Petit-Saconnex, Grottes / Saint-Gervais and Paquis / Nations. Geneva is the seat of the European headquarters of the United Nations and of many other inter-governmental organizations. Switzerland is a peaceful, prosperous, and stable modern market economy with low unemployment, a highly skilled labor force, and a per capita GDP ($40,100 in 2007) larger than that of the big Western European economies. 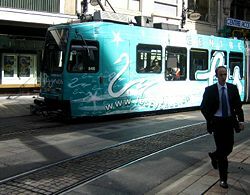 Geneva's economy is mainly services oriented. The city has an important and old finance sector, which is specialized in private banking (managing assets of about 1 trillion USD) and financing of international trade. It is also an important center of commodity trade. About 24,000 people worked in the numerous offices of international organizations located in Geneva in 2001. Geneva hosts the international headquarters of companies such as Japan Tobacco, Mediterranean Shipping Company, Serono, SITA, Société Générale de Surveillance and STMicroelectronics. Many other multinational companies like Caterpillar, DuPont, Take-Two Interactive, Electronic Arts, Hewlett-Packard, INVISTA, Procter & Gamble, and Sun Microsystems have their European headquarters in the city also. There is a long tradition of watchmaking (Baume et Mercier, Chopard, Franck Muller, Patek Philippe & Co., Rolex, Raymond Weil, Omega). Two major international producers of flavors and fragrances, Firmenich and Givaudan, have their headquarters and main production facilities in Geneva. The city's main newspaper is the Tribune de Genève, with a readership of about 187,000, a daily newspaper founded in 1879. Le Courrier, founded in 1868, was originally supported by the Roman Catholic Church, but has been independent since 1996. Geneva is covered by the various French language radio networks of the Swiss Broadcasting Corporation, in particular the Radio Suisse Romande. The main television channel covering Geneva is the Télévision Suisse Romande. The Geneva Motor Show is one of the most important international auto-shows. The show is held at Palexpo, a giant convention center located next to the International Airport. Geneva is connected to both the Swiss railway network SBB-CFF-FFS, and the French SNCF network, including direct connections to Paris, Marseille and Montpellier by TGV. Geneva is also connected to the motorway systems of both Switzerland and France. Public transport is by bus, trolleybus, tram, or by boat, which link the two banks of the lake within the city. The city is served by the Geneva Cointrin International Airport. As of June 2008, the population of the city of Geneva was 186,825. The city of Geneva is at the center of the Geneva metropolitan area, known as the agglomération franco-valdo-genevoise in French, which includes the Canton of Geneva as well as the District of Nyon in the Canton of Vaud and several areas in the neighboring French departments of Haute-Savoie and Ain. In 2005 the agglomération franco-valdo-genevoise had 769,000 inhabitants, two-third of whom lived on Swiss soil and one-third on French soil. The population of the canton contains 148,500 people originally from Geneva (33.7 percent), 122,400 Swiss from other cantons (27.6 percent) and 170,500 foreigners (38.7 percent), from 180 different countries. Including people holding multiple citizenship, 54.4 percent of people living in Geneva hold a foreign passport. The ethnic make up of Switzerland is: German 65 percent, French 18 percent, Italian 10 percent, Romansch 1 percent, other six percent. Geneva is remarkable for its linguistic diversity, the result of the presence of the United Nations and over 150 international organizations, the headquarters of some 140 multi-national companies, 120 diplomatic missions, and centuries of trade. Geneva has a 40 percent non-Swiss resident population with English the language of communication. German, which is spoken by 63.7 percent of the Swiss population, French 20.4 percent, and Italian 6.5 percent, are all official languages. While Geneva is usually considered a Protestant city, there were more Roman Catholics (39.5 percent) than Protestants (17.4 percent) living in the Canton in 2008. About 22 percent of the inhabitants claim no religion, and the remainder practice Islam (4.4 percent), Judaism (1.1 percent), other religions, or did not respond. Geneva is home to the University of Geneva, founded by John Calvin in 1559. 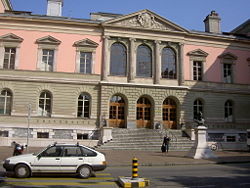 The oldest international school in the world is located in Geneva, the International School of Geneva, founded in 1924. Webster University, an accredited American university has a campus in Geneva. The Geneva School of Diplomacy and International Relations is a private university on the grounds of the Château de Penthes. The European Organization for Nuclear Research, or CERN, is probably the best known educational and research facility in Geneva. Founded in 1954, CERN was one of Europe's first joint ventures and has developed as the world's largest particle physics laboratory. The World Intellectual Property Organization. Since 1818, a particular chestnut tree has been used as the official "herald of the spring" in Geneva. The sautier (secretary of the Parliament of the Canton of Geneva) observes the tree and notes the day of arrival of the first bud. While this event has no practical impact, the sautier issues a formal press release and the local newspaper will mention the news. As this is one of the world's oldest records of a plant's reaction to climatic conditions, researchers have been interested to note that the first bud appears earlier and earlier in the year. The first recorded dates were in March or April. In recent years, it has usually been in mid-February and sometimes even earlier. In 2002, the first bud appeared unusually early, on February 7, and then again on December 29 of the same year. The following year, one of the hottest Europe has ever had, became a year with no bud. In 2008, the first bud also appeared very early, on February 19. CERN built the Large Hadron Collider, which is the world's largest and highest-energy particle accelerator, intended to collide opposing beams of protons or lead ions. It lies underneath the Franco-Swiss border between the Jura Mountains and the Alps near Geneva. Geneva observes Jeune genevois on the first Thursday following the first Sunday in September. By local tradition, this commemorates the date the news of the St. Bartholomew's Day massacre of Huguenots reached Geneva. The "Escalade" (literally, "scaling the walls") on December 11-12 each year, which commemorates victory against Roman Catholic Charles Emmanuel I, Duke of Savoy, in 1602, is Geneva's main patriotic celebration. The main sport team in Geneva is Servette FC, a football club founded in 1890 and named after a borough on the right bank of the Rhône. Geneva is also home of the Genève-Servette Hockey Club, who play in the Swiss National League A.
Geneva was a center of Protestant activity in the sixteenth century, the base for Protestant leader John Calvin, and a favored destination for persecuted Protestants. The city is synonymous with humanitarianism, being the birthplace of the Red Cross, and of the man who formulated the Geneva Convention. A noted center for international cooperation, the city hosted the headquarters of the League of Nations, remains the seat of the European headquarters of the United Nations, and of many other inter-governmental organizations. CERN's Large Hadron Collider is located nearby. Geneva has a touch of opulence, is the home of Rolex watches, and has a per capita GDP that is larger than that of the big Western European economies. A 2008 survey by Mercer Consulting found Geneva to have the second-highest quality of life in the world, tied with Vienna, Austria, outranked only by Zurich. ↑ Swisstopo, Height reference for Switzerland. Retrieved November 18, 2008. ↑ OCSTAT. Les binationaux dans le canton de Genève. Résultats du recensement fédéral de la population 2000. Communications statistiques n° 24, Geneva, December 2005. ↑ Statistique Genève, Inhabitants of the Canton of Geneva according to their religion. Retrieved February 1, 2007. ↑ REPUBLIQUE ET CANTON DE GENEVE, La Treille, promenade et lieu d'observation climatique. Retrieved November 18, 2008. ↑ Mercer Human Resource Consulting, Mercer's 2008 Quality of Living survey highlights. Retrieved November 18, 2008. Cityspots. 2007. Geneva. Peterborough: Thomas Cook. ISBN 9781841577722. Dieter Fahrni. 2003. An Outline History of Switzerland. From the Origins to the Present Day, 8th edition. Pro Helvetia, Zürich. ISBN 3908102618. Monter, E. William. 1967. Calvin's Geneva. New dimensions in history: Historical cities. New York: Wiley. OCLC 183613. Senarclens, Jean de. 1995. Geneva: Historical Guide. Genève: Editions du Tricorne, S. Kaplun. ISBN 9782829301445. World Fact Book. 2008. Switzerland. Retrieved November 14, 2008. This page was last modified on 26 May 2017, at 16:23.